One more and I will finally be done with the Bakugan attribute symbols. Whew. I made this one awhile ago but have been sick so no bento posting. 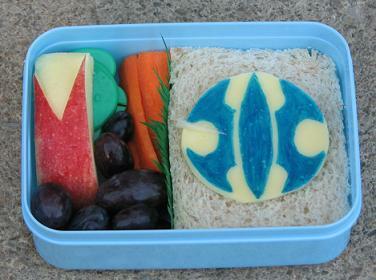 This bento contains the Aquos symbol on cheese *drawn on with food markers* on top of a soy turkey sandwich. Along for the ride are carrots, grapes, an apple bunny, and a container of dressing. 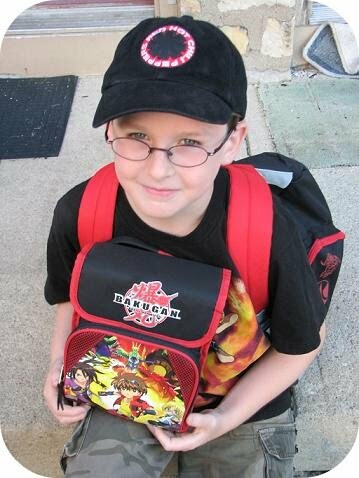 This is Kidlet's new Bakugan lunchbox. He lost a tooth and the Tooth Fairy happens to be very bargain savvy and scored this special prize for.....$1.50. Yeah. That Tooth Fairy is pretty amazing. Of course in addition to giving up a baby tooth, he also had to solve a scavenger hunt to find this present. I would have taken a picture of the hunt but he woke up early and had it solved and torn down before I was up. 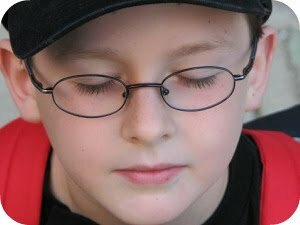 And this was when he got tired of me taking pictured and thought that if he pretended to be asleep sitting up I would stop. Hah. He should know by now that nothing will stop my picture taking. I think he looks rather sweet when he's sleeping so it worked for me! What brand of food markers do you use? The ones I have are *terrible* on cheese. My kidlet would love to get something other than pyrus hehe. I’ve given you a blog award, please stop by my blog to collect it! My child would FLIP OUT over this!! !